I roll into the tiny town of Chitwan, Nepal from hectic Kathmandu in the northeast after about six hours of jarring mountain switchbacks on a rickety, stifling hot local bus. Climbing down, I weave jelly-legged through a throng of jostling hotel sign-holders to the guy pinching a piece of paper with my name scrawled in blue ink. We drive a quick 5 minutes to Hotel Hermitage, which sits on the rim of lush, jungle-y Chitwan National Park. There, upon checking in, my guide Madan hands me a well-structured tour itinerary for the next three days of my stay. Without pausing to so much as splash water on my sweaty, dusty face, I grab my camera and we’re off, meandering down the road to explore a local village, home of Nepal’s indigenous Tharu tribe people. 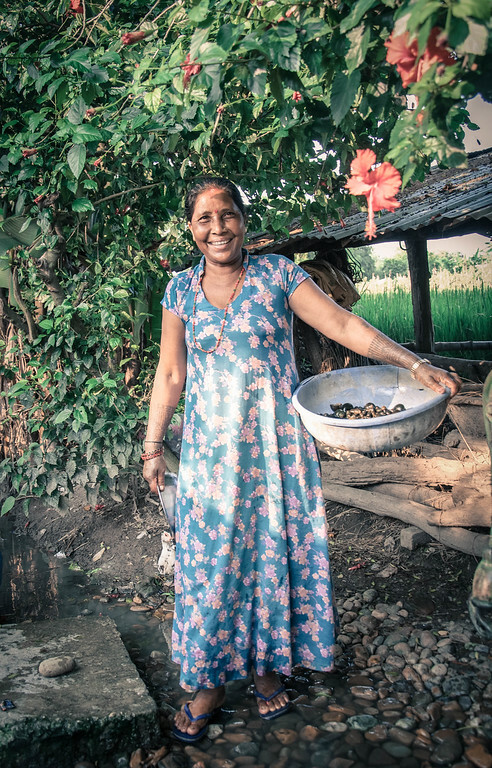 What’s so special about the Tharu? Madan explains as we walk that, with only a few small exceptions such as electricity, they have somehow managed to retain their simple, traditional way of life for hundreds of years, without any change at all. 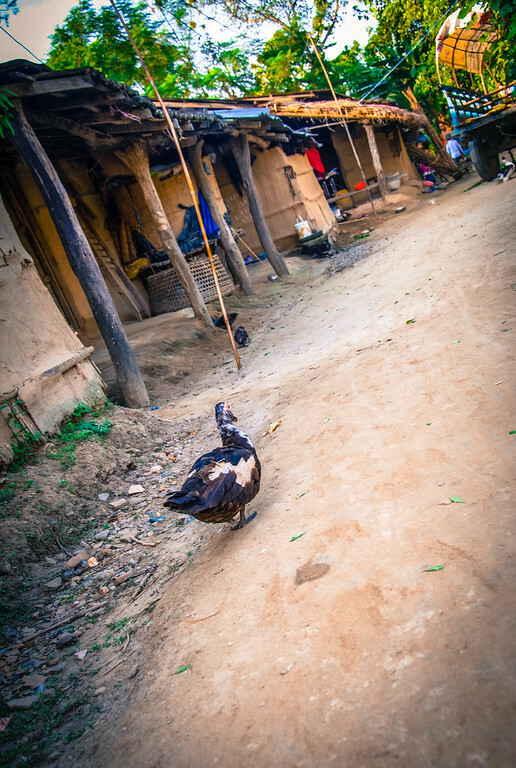 Sprouting from the paved main road that disects Chitwan, a dirt path leads into the center of a thriving Tharu village. Madan and I pass rows of rustic badaghar, or longhouses, which shelter 40-50 people, including multiple generations of families. Inside the village, daily life is happening all around. 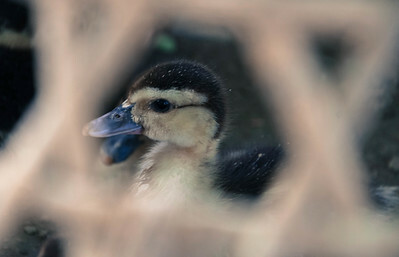 Ducks and chickens with mottled coloring roam and peck for stray seeds while chicks and ducklings peep softly from cages of overturned baskets. Nearby, several goats are tied to fenceposts, loudly bleating their objections. 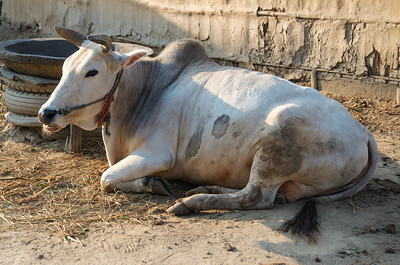 Hump-necked cows are prevalent, some are yoked in pairs to wooden carts, while others lounge in the early evening sunlight, munching on dried grass. 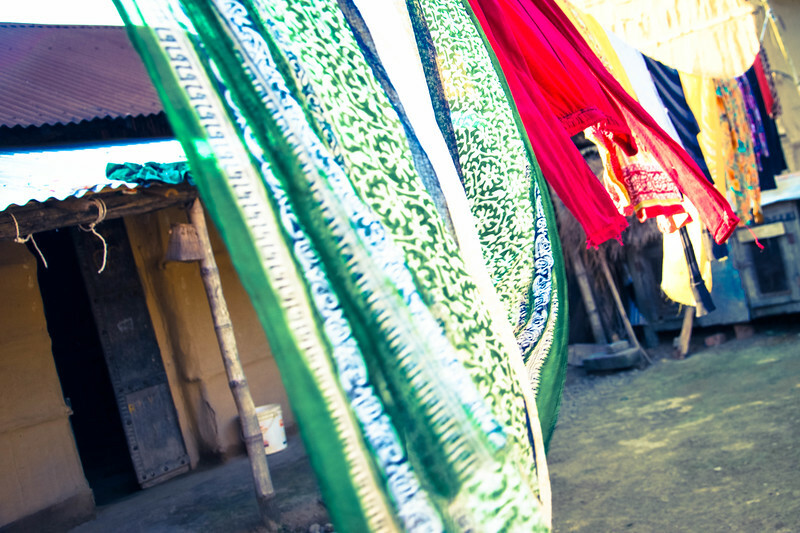 Vibrant saris and traditional clothing hang in the hot breeze from clotheslines, fences, roofs or anything else that does the trick. 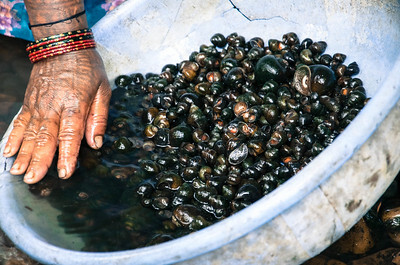 At the far end of the village (it doesn’t take us long to reach it), a woman bends at the waist before the communal water pump rinsing a giant bowl filled with large and small river snails. Though it’s a lot of work to dislodge the small amount of meat in each shell, snails are an important source of protein in this region. The snail meat usually ends up in a spicy curry. 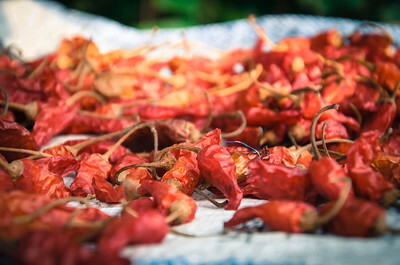 The Tharu people grow extra-hot chili peppers to make their food really, really spicy. Madan says they like their food so spicy that it’s too much for even the average heat-loving Nepali to handle. 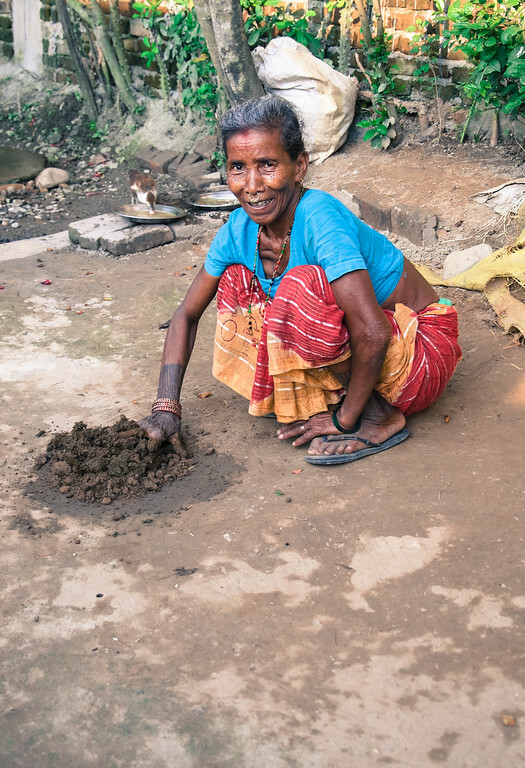 Like much of Asia, the Tharu tribe also relies heavily on rice. 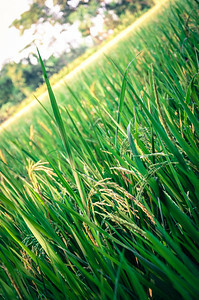 I can see that the grains and grass in the paddies are beginning to turn yellow — a sign that it’s almost harvest time. Only about one more month to go. 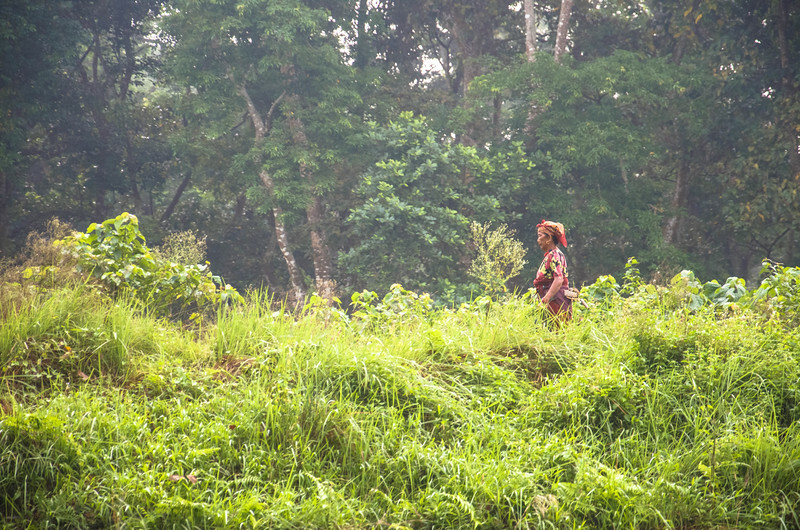 Because they grow, scavenge, raise or hunt everything they eat, this tribe’s meals are extremely healthy. They don’t have a need to earn much money, so they generally can’t buy modern junk food, which is abundantly available in Chitwan. They do occasionally enjoy sweets, however, from molasses and wild honey; and during festivals, they’ll indulge in a hard alcohol made from rice. The work involved with everyday living is difficult, and the lifespan here is not terribly long. 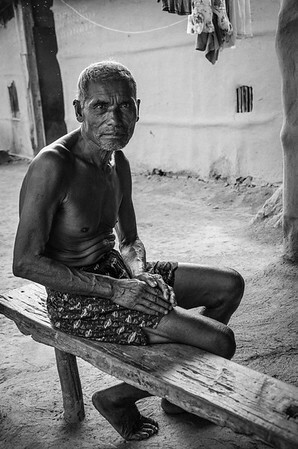 Age and wisdom is revered, and the Tharu are led by an elected elder chief, always male, whose term is only one year. An aged man watches Madan and me with an expression of curiosity as we with stroll though his midst. He seems kind, and returns my bow and “Namaste.” I imagine he’s seen his share of hard work. 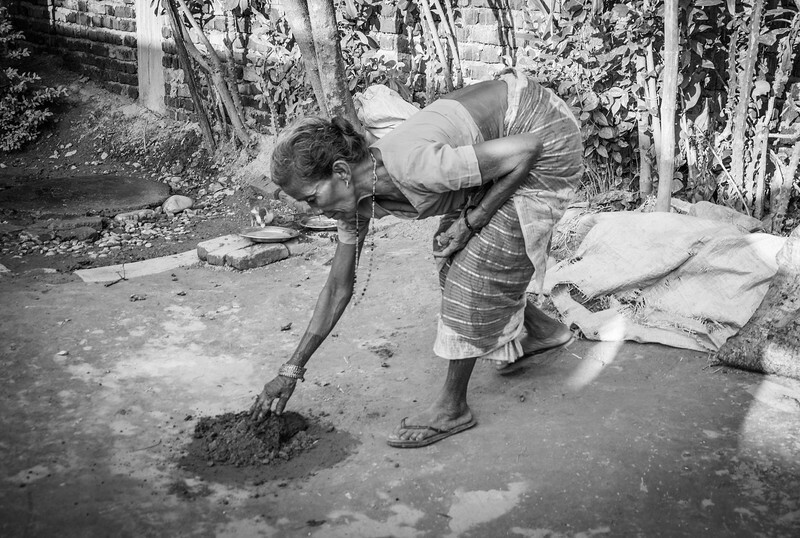 Madan tells me that the badaghar roofs (thatched palm leaves) and walls (a mixture of mud, grass and dung) must be replaced at least once per year — though the villagers have recently begun to use corrugated metal for the roof when they can afford it, because, unsurprisingly, it leaks less. The Tharu are big on celebrations. Marriages are cause for festivities (once arranged before birth, now ‘love marriages’ are more common). 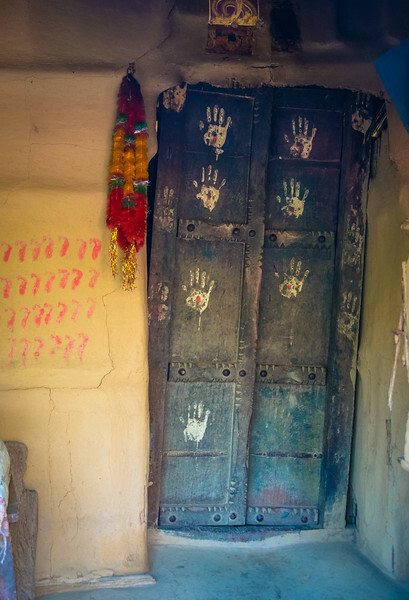 And several times per year, houses are decorated (like this door and wall below), costumes are brought out, and the traditional music is cranked up. Some holidays are widespread, like Diwali, the Hindu festival of lights (the majority of these tribes are Hindu). However, many of the celebrations are derived from age-old, strictly Tharu traditions. The following evening, I’m treated to a demonstration of their cultural dances. Each one is incredibly precise, involving intense choreography and timing to tell stories. 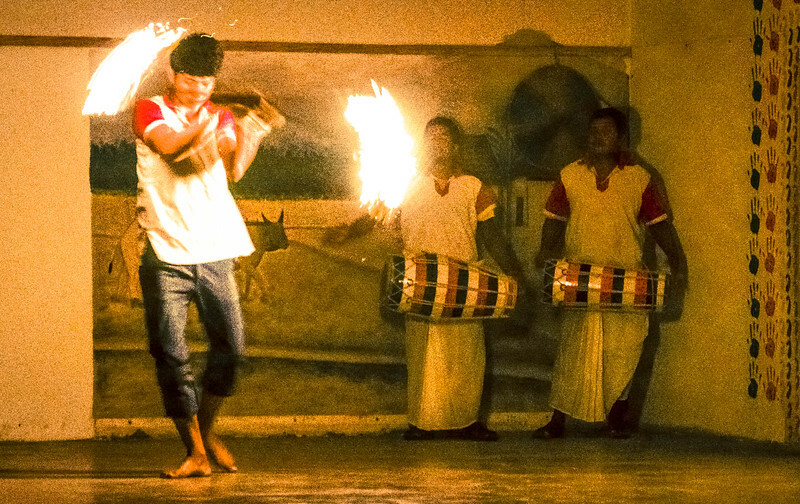 Drums keep the beat while young women and men in pure white dress with colorful embellishments chant and sing in rhythmic stomping lines and circles. Some of the dances celebrate the harvest, like the one above. And some, like the one below, are meant to raise the collective adrenaline and prepare men for a hunt or war. 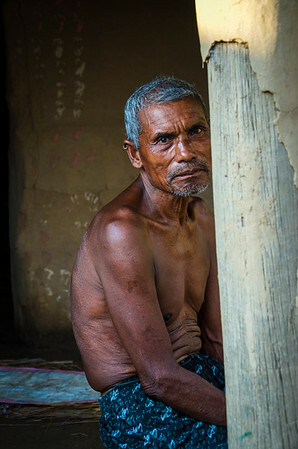 At the end of the day, the Tharu are a peaceful people who just want to live their lives in the forrest they’ve always known, and carry on their cultural traditions without the heavy hand of the outside world. Nepal’s government has realized the value of allowing their culture to remain intact. With any luck, they’ll keep walking those timeless cultural paths far into the future. 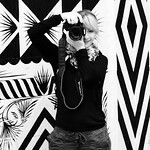 Great Blog with great photography! Great powers of description taking me as close as I can to a culture I haven’t experienced. Love the detail of observation.